US Hair Restoration believes in providing quality hair transplants and top-notch service to people dealing with hair loss. We use the most up-to-date medical technology and proven techniques to produce natural-looking results. 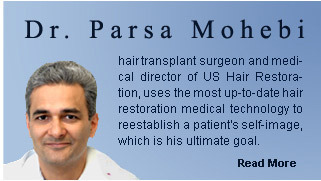 Our work has been documented and published in various articles in the surgical hair restoration field. For quality hair restoration procedures, our reasonable costs have helped us to establish a credible place in the hair transplant industry. We have several locations in Southern California to serve you: Orange County, Beverly Hills, and Los Angeles. Contact us today to set up an intial consultation at 818.788.8363.